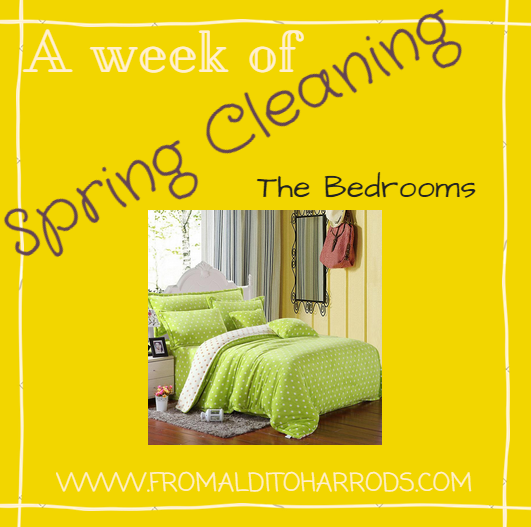 Continuing our week of Spring Cleaning, today we are tackling the bedroom(s) in your house. Remove electric blanket and store. Wash bedding including pillows & protectors. Freshen your mattress by sprinkling some bicarbonate of soda and vacuum it up after 30 minutes. Wardrobe – hang up items that have fallen down, put aside clothes to sell, donate or throw out. Drawers – remove items, clean the inside and replace items neatly, looking to see if there is anything you can get rid of. Under the bed – sort and put away anything that was under there and vacuum underneath. Shelves and wall hangings – remove items to dust then decide if anything can be sold/donated/thrown out. Remove items that do not belong in the bedroom. Tomorrow we will be tackling the dining room.